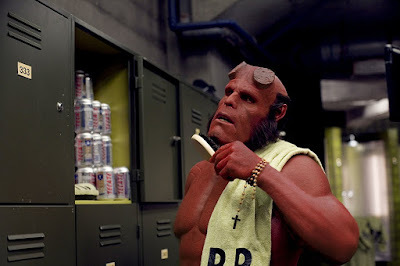 Many of you may be familiar with the proverbial anti-hero character of Hellboy, of both the comic and movie fame. Hellboy is a walking oxymoron, he’s what you would call a “good demon”… but in case you think all demons are actually quite ‘nice’ and ‘adorable, Hellboy’s the singular exception to the rule. In the story, the eponymous character was summoned during the last days of the Second World War by the Nazi forces in the hope that he would help them turn the tide against the Allied Forces. However, the ceremony is interrupted by a platoon of Allied Forces, and the infant demon is ‘saved’ by the kindly Professor Bruttenholm, who adopts him as his own son, and as both the comics and the movie would hint at, raised him as a Catholic. The religious and ‘Catholic’ undertones of the story are hardly subtle. At the end of the movie, at a dramatic point of almost turning to the evil side, reverting back to his demonic nature, Hellboy is tossed the rosary that had belonged to his departed adopted father and is then reminded who he is and what he chose to be. He then proceeds to rip the horns from his head and fight for good. The crucifix of the rosary seared its mark into the palm of Hellboy as he catches it. A kind of stigmata. The imagery is clear to us Christians, it is by the power of the Cross that we are saved, where even the greatest sinner is redeemed and a saint made. Eventually, Hellboy, who was originally summoned and sent to destroy the world would prove to be its saviour. ‘What? That’s ridiculous!’ you may protest. But that’s the meaning of redemption. What’s the key of his redemption? It’s found in the answer given to a question that is raised at the beginning of the movie, “What makes a man a man?” The answer can only be found at the end of the movie. Before the closing credits, we hear another voice over narration which sums up the whole journey of Hellboy, from demon to perhaps, the most unlikely saint: “What Makes a Man a Man, A friend once wondered. Is it his origins, the way he comes to life? I don't think so. It’s the choices he makes; not how he starts things but how he decides to end.” Repentance is the key to redemption, the key that sets one on a different course in life. This is what happened to the first son in our gospel parable. His story parallels that of the Prodigal Son in the Gospel of St Luke. Like the prodigal son, the first son displays an insolence that is unimaginable. When asked to go and work in his father’s vineyard, he replies curtly and defiantly, “I will not go!” At the time of Our Lord, no son would dream of speaking to his father in this way. Indeed, a son could be killed by his father for such insolence! However, something amazing takes place. The parable tells us that he had a change of mind, he “thought better of it and went.” This is what repentance is all about. There are two words in Greek for 'repent.' The first one is the word “metanoeo” which means regret and forsaking the evil by a change of heart. This is the word that is associated with Our Lord’s initial call, “Repent and Believe!” But the repentance expressed by the son here is a different word. It is the word “metamelomai.” It indicates a strong remorse for one’s actions, a certain disgust with one self. It entails changing one’s mind in such a deep and radical way which eventually leads to a different direction in life. It makes the man love what he once hated, and hate what he once loved. Ultimately true repentance results in a change of actions. There is still the matter of the Third Son in our story. The third Son says, “Yes, Father, I will go and work in your vineyard.” And, behold, he does what he said he would do. He has no need of repentance like the first son, because He has never gone against the will of the Father. He is the Son who pleases his Father in both word and deed. The third Son is the One who told this parable. He is Jesus Christ, the enfleshed Son of God, who was perfectly obedient to the will of his Father. This is the Son who said ‘yes’ to the Father and began His mission by situating Himself at the very centre of the history of those who were lost and in need of redemption. He weaved His own history into the history of sinners in order that He may redeem that history and chart a course for a new future. This is the Son who chose to end His story by that great sacrifice on the cross; and by His death and resurrection, He has made all things new. We evade, we fail, we fall, we slide, we slip, we stumble, we sin, but our loving Heavenly Father is always there, ready to pick us up, to give us another chance, if only we open ourselves to repent, to change, to live in harmony with His will, to become what God has created and called us to be. Repentance takes us beyond good intentions. Repentance moves us beyond our historical baggage. What is most vital, however, is our personal openness to the grace and mercy of God. With such powerful help, even the most tawdry or sordid past can be forgotten and forgiven. It’s not how you start things but how you decide to end the story that matters.